On Saturday 15th April 1989, Liverpool FC were due to play Nottingham Forest in the semi-final of the F.A. Cup. In 1988, the same teams played in the same round of the same Cup and at the same venue; The Hillsborough Stadium in Sheffield, home to Sheffield Wednesday FC. In 1988, Liverpool FC complained to the Football Association that, despite having a far larger average support than Nottingham Forest, they had been allocated the far smaller Leppings Lane end of the ground rather than the much larger Kop end. The reason given for this decision was due to the direction from which the two sets of supporters would have arrived from, and according to the South Yorkshire Police it was easier to segregate the opposing fans on that basis. Chief Inspector Brian Mole , a match commander with significant experience of policing big matches at Hillsborough presided over the policing of the 1988 semi-final. 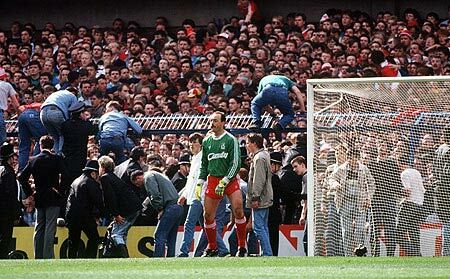 Although there were complaints from Liverpool supporters of over-crowding in the central Leppings Lane pens, the match in 1988 passed without serious incident. The semi-final in 1989 once again saw Liverpool drawn against Nottingham Forest at Hillsborough with Liverpool allocated the smaller end of the ground. Liverpool FC complained and once more their concerns fell on deaf ears. So the date was set. Saturday 15th April 1989, Liverpool would play Nottingham Forest at the Hillsborough Stadium in Sheffield. Planning for this huge match started in earnest, and Chief Inspector Brian Mole dusted down the successful operation order from the year before and started putting plans in place. However he was removed from his position just a few short weeks before the semi-final was due to take place and Chief Inspector David Duckenfield, an officer with no experience of policing a match of this size, was promoted in his place. The now Chief Constable of the South Yorkshire Police, Meredydd Hughes, admitted to the Guardian’s David Conn in a 2009 interview that this was “the wrong decision”. The first of many mistakes had been made. In 1988, under the watchful eye of the experienced Brian Mole, the South Yorkshire Police had set barricades across the road leading to the Leppings Lane turnstiles. These roadblocks were primarily to stop ticketless fans getting to the area outside the turnstiles, an area that had been constantly problematic on big match days as the number of people that could arrive in the courtyard outside the turnstiles was far larger than could be safely admitted through them. As Prof. Keith Still, an expert of over 20 years in Crowd Dynamics told me when I interviewed him for the forthcoming documentary – from a crowd planning point of view the Leppings Lane end had “a high risk of failure by design”. In essence, the Leppings Lane concourse area outside the turnstiles allowed far more people to arrive than the turnstiles could admit. Above: Video clip of Professor Keith Still. Full interview to be used in the documentary. In 1989, the rookie match commander decided against these barricades. This was the second mistake. The South Yorkshire Police now had no way of controlling the flow of fans towards the problematic Leppings Lane turnstiles. As a result, more and more people arrived and entered the courtyard outside the turnstiles, but the decrepit and malfunctioning turnstiles could not (even on a good day) admit the growing numbers safely. The crowd outside started to grow at around 2.30pm, a full 15 minutes before the official match ticket stated that supporters were to be in the ground. This in itself dispels the myth that Liverpool fans turned up late. Once supporters had entered the courtyard outside the turnstiles, the sheer weight of numbers arriving behind them meant that they couldn’t exit the crowd. As everyone individually shuffled forward eager to get in before kick-off, the crowd started to compact and a vice-like crush developed. There were shouts and screams from scared people who were struggling to breathe. The turnstiles themselves were set into a brick wall, and the people at the front were being crushed against that wall. The police had lost control, and there was now a clear & present danger that somebody could be seriously hurt, or worse. Fans continued to arrive at the back of the throng – in good spirits and unaware of the problems at the front of the crowd. Outside the turnstile area was in a desperate state, and inside viewing via CCTV cameras, the rookie match commander David Duckenfield looked on. 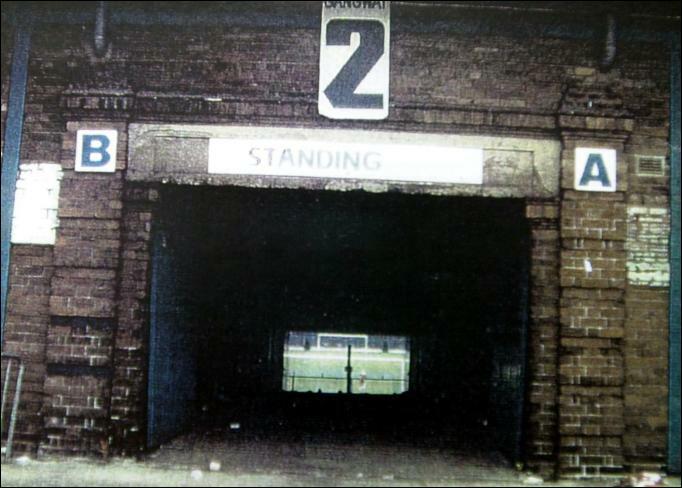 In those days, fans were filed into a ground via tiny turnstiles to allow for tickets to be checked. Fans then exited via huge metal exit gates. As the final whistle approached, stewards would open these gates to allow people out quickly. These gates were never designed to allow entry to a ground, but the situation outside the Leppings Lane turnstiles had become so dangerous and the police had now lost control of the situation and started to consider the possibility. Directly behind exit gate C was a tunnel that led to the central pens behind the goal, named pens 3 & 4. Above that tunnel was the single world ‘STANDING’. It was the only obvious way for fans entering the turnstiles to gain entry to the terraces and it is where most people headed. The tunnel was long and fans were taken down a 1 in 6 gradient slope in the semi-dark with just the bright light and green of the turf to head towards at the end. Quite literally, they could see the light at the end of the tunnel. As fans exited that tunnel they were right behind the gates allowing access to pens 3 & 4. In 1988, once these pens were full, the police would close off access and direct fans coming out of that tunnel would be led to the to the side pens. In 1989, this didn’t happen – resulting in fatal consequences. Meanwhile inside the stadium, BBC commentators, fans in the other stands, players and officials all commentated (as kick off approached) that the central pens were jam packed full, and that the side pens (or wing pens) were not even half full. People were sat on the floor reading programmes in the wing pens with enough room to swing a cat, whereas the central pens were jammed solid, barely moving. They were unable to move because of the sheer density of the crowd. David Duckenfield, in the police control box directly over-looking the Leppings Lane terrace had arguably the best view of anybody and also the CCTV cameras to pan and zoom at will. It was later noted by visitors to the police control box that the CCTV was so powerful that you ‘could see the colour of somebody’s eyes in the central pens’. Duckenfield was now being asked by a senior colleague, who was policing the now desperate area outside the Leppings Lane, to open the exit gate to alleviate the crush. Right in front of Duckenfield’s eyes was a mass of people virtually set in concrete in the central pens. The police box is elevated over the Leppings Lane terrace, and directly underneath Duckenfield’s feet was a sparsely populated pen. For those that have seen Jimmy McGovern’s excellent docu-drama, it was from this pen that Trevor Hicks was screaming at the police on the steps of the control box to do something. He could see that the crowd was in distress, and his two daughters Victoria & Sarah were in those central pens. His wife, Jenny Hicks was in the North stand and was also extremely concerned as she looked at the central pens, However the police who had the duty of care, who had a bird’s eye view, did nothing. The officer outside the ground, Bernard Murray, radioed to Duckenfield to “open the gate” and a little later shouted “if you don’t open the gate, somebody is going to get seriously hurt out here”. The final request came, almost pleadingly “are you going to open the gate?” After a pause, which must felt like a lifetime, Duckenfield gave the order to “Open the gates”. The next mistake resulted in the loss of 96 lives, the injuries of hundreds more and the fallout impacted on thousands of friends and family members. As already stated, in the 1988 semi-final police and stewards were stationed at the gates leading into the central pens to direct fans safely away to the wing pens once full. Had Duckenfield given the order to seal off the obviously over-full central pens when he gave the order to open the gates, then disaster would have been averted. But he didn’t, and hundreds more fans made their way into the dark tunnel, with a steep slope. As some started to lose their footing they were virtually stumbling into the stadium, like a human river, and straight onto the back of an already dangerously over-full terrace. The official government enquiry into the Hillsborough disaster, chaired by Lord Justice Taylor, and now known simply at The Taylor Report, later called the decision not to seal off the over-full central pens “a blunder of the first magnitude”. Eventually, under the strain a crush barrier made from metal and steel buckled, gave way and a human wave of suffering went down, body over body. At the front people were screaming at the police, positioned directly outside the fence between the pitch and the terrace, to open the gates at the front. The police ignored these requests even though people were dying in front of them. In fact at once point a gate sprang open under the immense pressure of bodies, and the officers on the track forced it closed again. It turned out that Duckenfield had given strict orders not to open the gates under any circumstances without his express permission, and at that point the police radios reportedly malfunctioned. “The crush came … it wasn’t a surge. It was like a vice getting tighter and tighter and tighter. I turned Adam round to me. He was obviously in distress. There was a police officer, about five or six feet away and I started screaming. Adam had fainted and my words were ‘my lovely son is dying’ and begging him to help me and he didn’t do anything. I grabbed hold of Adam’s lapels and tried to lift him over the fence. It was ten feet or thereabouts with spikes coming in. I couldn’t lift him. So I started punching the fence in the hope I could knock it down. Right at the beginning, when I was begging that officer to open the gate I know I could have got Adam out. I know that because I was there’. Adam Spearitt, 14, died at Hillsborough. Jenni Hicks and her husband, Trevor, who had been screaming at the police to help earlier, lost his two daughters Vicky (15) & Sarah (19). 96 lives were taken that day in total. Men, women and children. One as young as 10 years old died at a football match. What happened next is almost more harrowing and disgraceful, but I will write a follow-up post to cover that in due course. The biggest cover up in legal history. JFT96, their families and all the survivors. In any other walk of life, ineptitude of this nature gets you the sack, or a least, some telling reprimand! A terrible, terrible day, for ALL football fans. In any other walk of life, ineptitude of this order, would at least get a heavy reprimand, or more likely, the sack. I know exactly where and what I was doing on that awful afternoon. Playing and enjoying football! I was wondering whether you’d be interested in the contents of this essay I did a while ago. I have been a supporter of Sheffield Wednesday all my life, I know the Leppings Lane end very well and it has long been a concern re the one central entrance to the standing area. There are two entrances around the sides but they are not obvious. I absolutely agree with your comments re the earlier crowding, this would not have happened in previous years for 2 reasons. 1. in the previous years, the entrance to the tunnel was closed off when capacity was reached and supporters were directed to the side entrances. 2. the lateral fences which split the standing area into pens would not have been there thus allowing the fans to spread through into the wings and find their own level. Once the standing area had been into pens it was then imperative for the authorities to control the numbers going in because they could not spread out into the wider areas of the standing area. Therefore, leaving the entrance to the central area open whilst then opening Gate C added to an already worsening situation. The Police did not control the crowd outside like they did the previous year with barriers, they did not control the entrance to the central standing area and they did not have barriers inside to divert fans to the wings – if they had all this in place then much of what happened could have been avoided. On top of all the above…..there were too few bobbies on duty and inexperienced management who panicked, not a healthy combination. Then of course they cowardly blamed others for their actions…or lack of action. a national disgrace for which some officers need to face the full extent of the law.